Nougat 7.1.2 is the second latest version of the Android mobile operating system developed by Google. I call my remaster of it AndEX Nougat. It uses “my” special kernel 4.13.3-exton-android-x86_64 with some extra features. I.e. extra drivers. My Android-x86 KitKat 4.4.4 build from 2016-02-14 will also cost you 9 $. It has one advantages over the Nougat and Marshmallow versions: The system can be used also on older laptops. Read more about the KitKat 4.4.4 version 160214 or DOWNLOAD it instantly. Clash of Clans (a very popular epic strategy game) works very very well. Perfect video quality and audio. 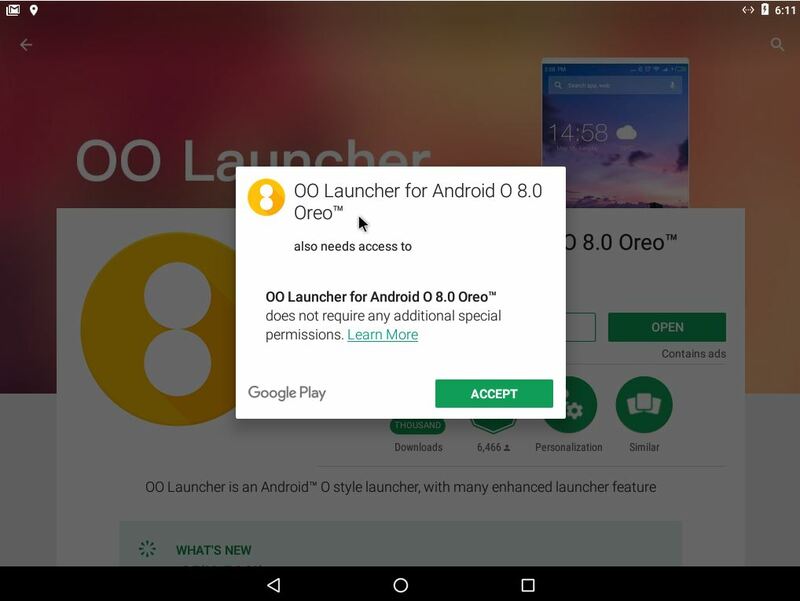 Install it very quickly using Google Play Store. If you have a touchscreen you can also (for example) run Wild Hunt, Flight Pilot, CSR Racing 2, Angry Birds, Bowmasters and Shooting King. 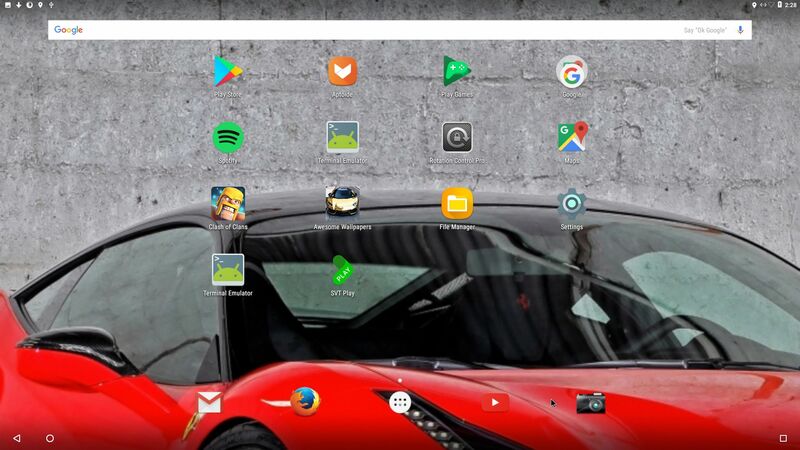 Watch a screenshot of the desktop when I have installed the just mentioned game apps. Say for example that you have a laptop with Windows 10 installed as the only operating system. 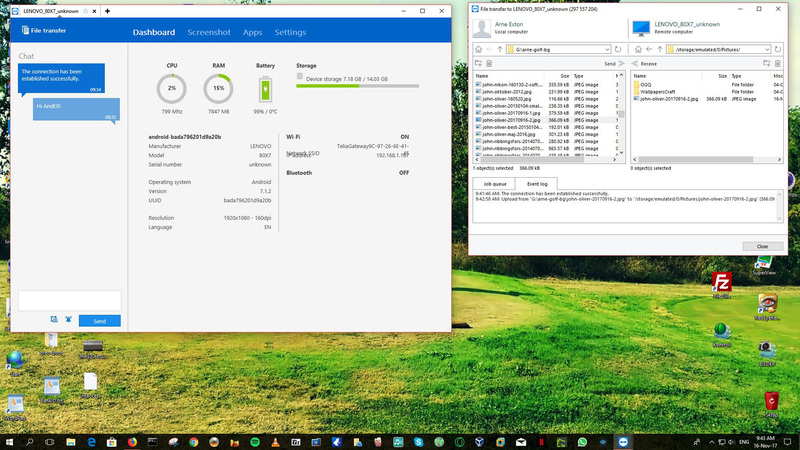 If you just create one extra partition of about 5 GB you can install Android Nougat on this extra partition and then “dual-boot”. I.e. 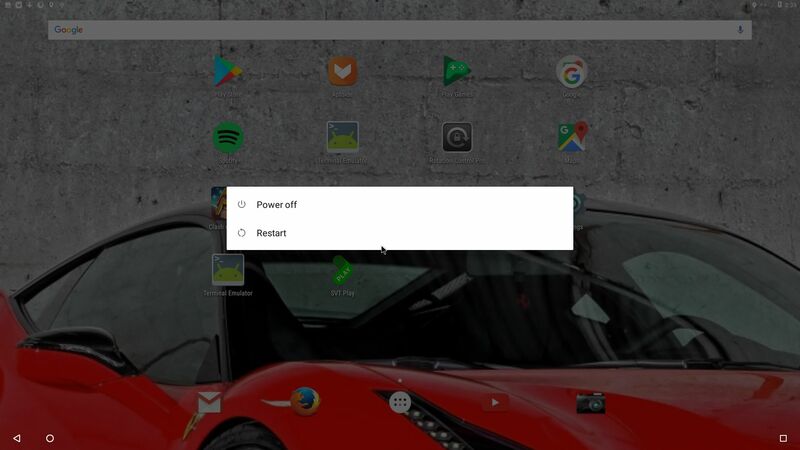 you can turn on your computer (called “booting it up”) and decide whether you want to start Windows or Android Nogat. 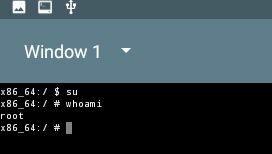 Grub will be installed as boot handler/loader during the installation of Android Nougat. Note: The installation will take only about one minute. And the installation to hard drive is so simple that a 10 year old child can do it. Please note that you can do the installation manually – see about that below. When you unzip android_x86_64-nougat-7.1.2-gapps-kernel-4.13.3-exton-1070mb-170930-ZIP.zip you will have a folder called NOUGAT-170924. It has five files, namely data (folder), system (folder), initrd.img, kernel and ramdisk.img. You can choose to place the folder NOUGAT-170924 on an empty ext4-formatted partition and/or in the root of another installed Linux system on your computer. If you have (for example) Ubuntu 17.04 installed on /dev/sda5 (and you chose to place the folder NOUGAT-170924 in the root of the partition /dev/sda5) the Grub2 boot lines would look like this. Bluetooth is not working. (You can enable Bluetooth and see units nearby though). As a good replacement for Bluetooth you can install the TeamViewer app. Read my instruction. 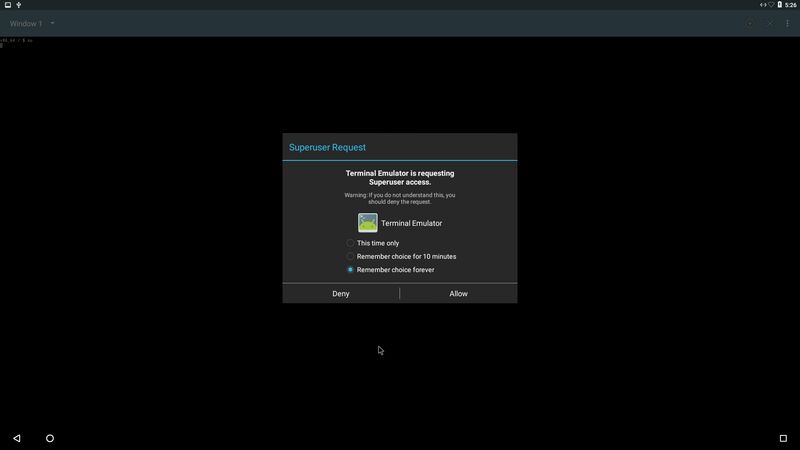 Learn how you can run AndEX from a USB stick with persistence. Read under A). NOTE: You can’t run AndEX Build 170930 live from a USB stick. You can, however, use the ISO file android_x86_64-7.1.2-nougat-gapps-kernel-4.13.3-exton-958mb-170930.iso and install to a USB stick the way I describe in my instruction. 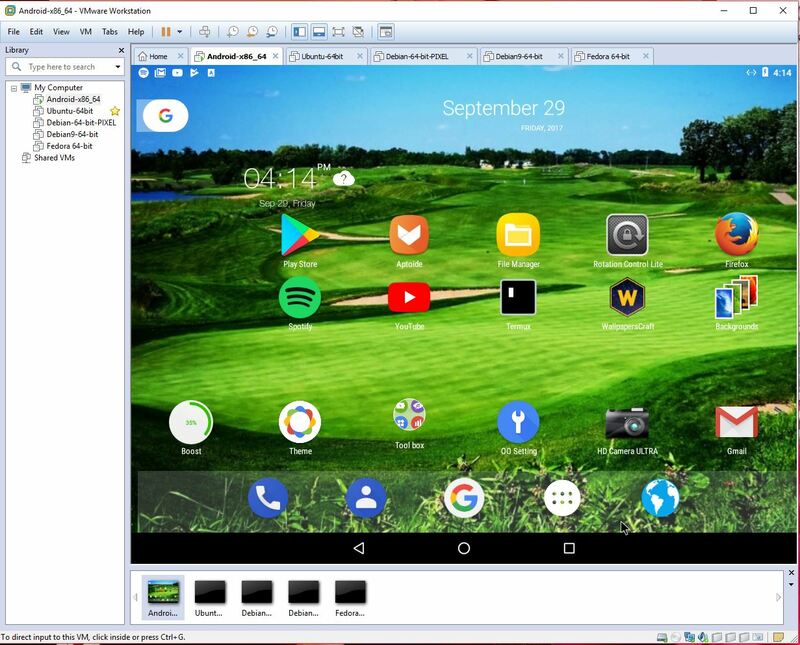 You cannot run AndEX Nougat 7.1.2 Build 170930 (from the ISO file) live in VirtualBox and VMware. But you can (of course) install AndEX 7.1.2 to a virtual hard drive in VirtualBox and VMware. AndEX Build 170930 will then run very well both in VirtualBox and VMware. I have kept one of my previous builds AndEX Nougat 7.0 161107 since you can run Build 161107 live in VirtualBox and VMware very well. AndEX 7.1.2 Build 170619 and AndEX 7.0 Build 161107 work very well in VMware (and VirtualBox) as I just said. Watch a slideshow, which shows all installation steps in VMware. 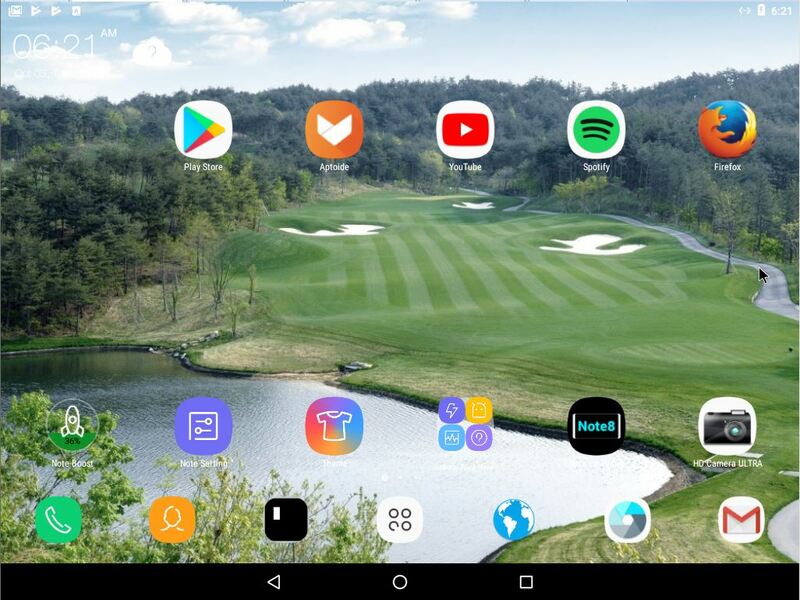 Well, if you like your Android phone and all the apps you have installed on it I’m sure you will also like to run apps from your laptop. Bigger screen and better sound etc. 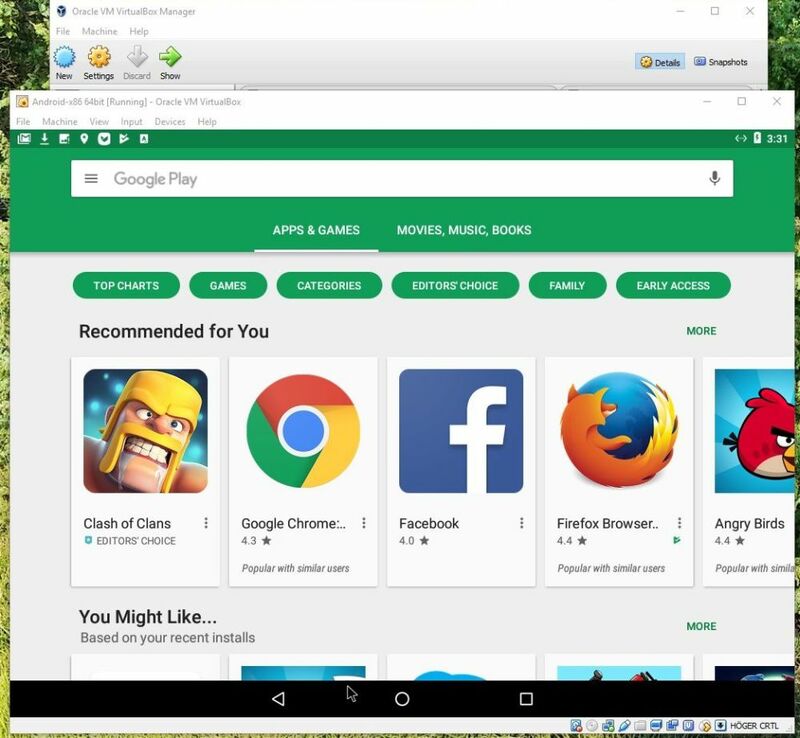 Also: In AndEX Nougat Build 170930 almost all apps and games can be installed via Google Play Store. You can even install very big games (of 1GB or so), but unfortunately almost all such games need a touchscreen. Still not convinced? Then read my article about “How useful an Androx-x86 system can be for the average computer user“. 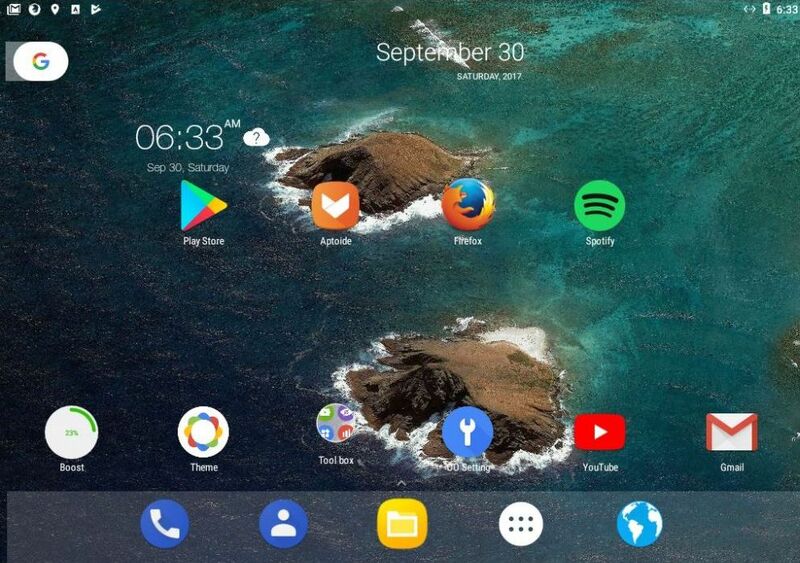 Before you buy and download this version of AndEX Nougat you must be aware of that not all apps downloaded from Google Play Store or Aptoide App Manager can run in an Android-x86_64 system. Some very big (around 1GB) games for example won’t run. On the other hand I could run Pes Club Manager, which is of 866 MB and Traffic Rider of about the same size. You must also be aware of that some (many) games need a touchscreen. Clash of Clans works very good though. So does Angry Birds. Go ahead and install them via Google Play Store. 1. 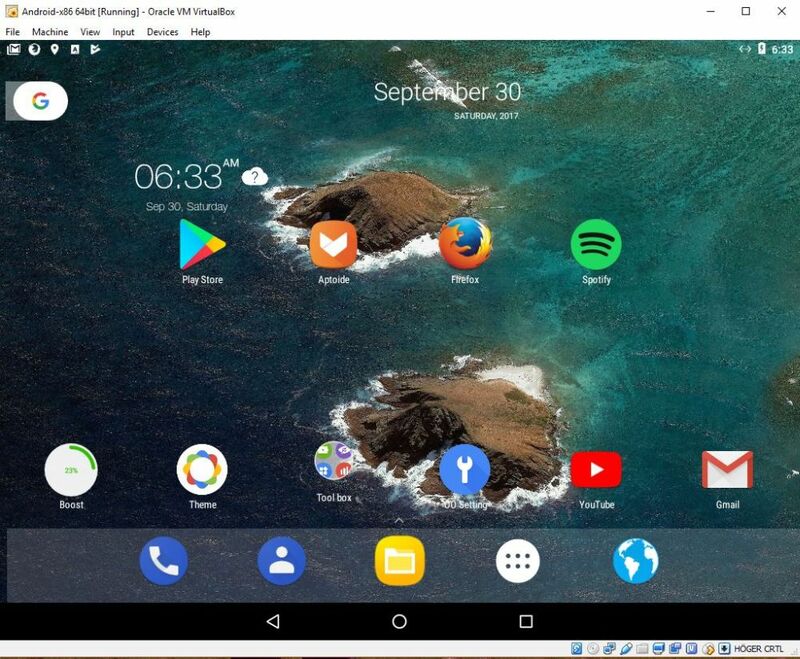 You cannot run AndEX Nougat 7.1.2 Build 170930 live in VirtualBox and VMware. Note that my other Android Nougat systems from 170619, 170201 respectively 161107 can run very well in VirtualBox and VMware. The system can be installed manually to hard drive. To be able to do that you must have at least one Linux system installed on your hard drive. You must also use Grub as bootloader. You can also (or alternatively) install AndEX 7.1.2 while running the system from a DVD or from a USB stick. Use preferably Rufus to create a bootable USB stick from the ISO android_x86_64-7.1.2-nougat-gapps-kernel-4.13.3-exton-958mb-170930.iso. Or burn the ISO file to a DVD and run the system from it. NOTE3: I have kept my previous builds of AndEX on the servers. 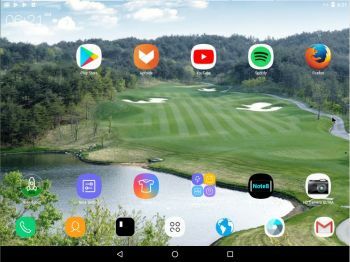 AndEX 7.1.2 Build 170619, AndEX 7.1.1 Build 170201 and AndEX Nougat 7.0 Build 161107 run very well live. I.e. from a DVD or a USB stick. And live in VirtualBox and VMware. 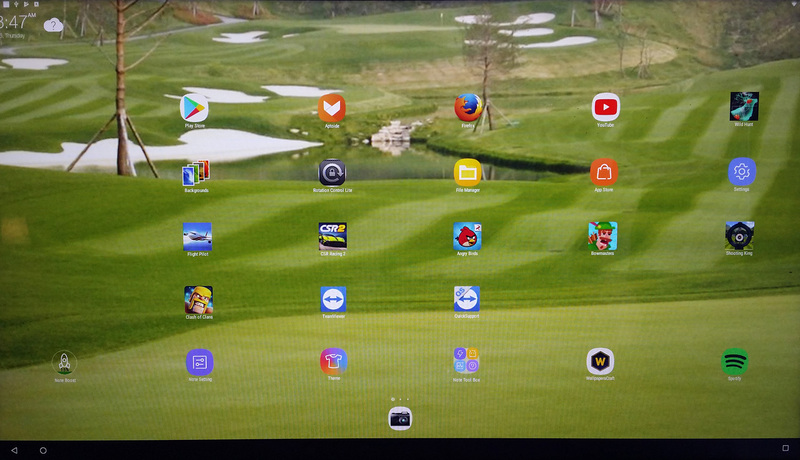 Note4: Android-x86 KitKat 4.4.4 Exton Build 9 160214 can run on many more laptops/computers than AndEX Nougat 7.1.2 and/or AndEX (Android-x86) Marshmallow 6.0.1.